How to walk your cat – almost anywhere. Some of my readers will know that we walk our cat Bobby. We started this out of necessity, because we live next to one of Cardiff’s busiest roads and I have seen many dead cats on it. Our cat is very precious to us. She is not very streetwise and reacts really daft – for example when we cross a road and she just bimbles along only to stop and stand (or even lie down!!) in the middle of it! She has no awareness of the danger cars pose. We have therefore secured our garden as much as possible for her, so she can’t, in theory, escape. Next to our neighbour, who used to own cats, we attached netting along the wall, while our wall next to the lane has plastic spikes. You can order both netting and spikes online, but I can’t remember where we got both from, best thing is to check places like Zooplus – see link on the left – or search Google. The spikes might even deter burglars, (who knows), though I doubt it as we had stuff stolen from our garage. Cats can and do get into our garden. These are the more adventurous types and if they are not too fat they also can get out. 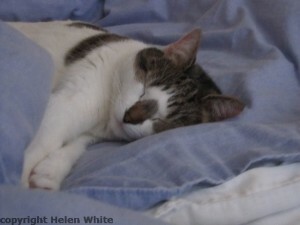 Our moggie isn’t fat, just incredibly lazy and totally people focussed. She’s mostly interested in what we are doing and always seeks out our company (a bit like a dog), so she has no desire to mount the wall and disappear, which we appreciate very much. She is also easy to bribe with food. 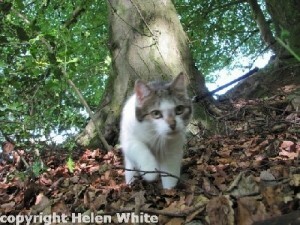 Bobby also likes to explore the front garden and go for a wander. And this is why we got her quickly used to her harness from an early age, when she was still a kitten. First we started her off just with a collar – she hates collars and we had to give up on collars in general, but then she gets spot on treatment for fleas, so a flea collar is not necessary (and she doesn’t roam). When she wears a collar she just gets in a right old state of panic and begins to choke. However we were very surprised to find that she took to her harness quite quickly – so in that regard we were extremely lucky. After a few days of wearing it in, we ventured out into the back garden with her, to get her used to the leash. The initial leash was very short. When we started walking her in the forest we actually bought a re-tractable one for small dogs. 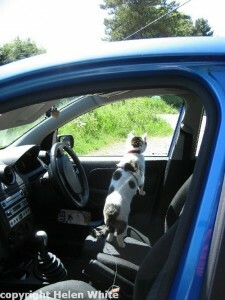 At first we got the wrong size for medium sized dogs – she almost flew back after pressing the button! Luckily our friends were quite happy to receive the leash for their dog as a gift. When we walk her, we sometimes let her off the leash, until she wants to venture out on the pavement. She also loves to walk along our garden wall and then jumps onto my husband’s shoulders, which is quite cute. She prefers him to me in that respect, because I am quite small and she doesn’t like to jump on mine, so I always end up grabbing her gently and she meows and complains until I put her down, clip her on and we can walk along the lane. 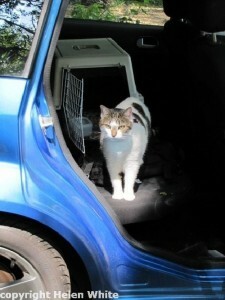 When we tried to walk her in the forest for the first time she didn’t even want to go into the carrier. As soon as she was in the car, she was calm. When we arrived at the forest it took her a moment to figure out that we were somewhere completely different and she really enjoyed her first walk, which took about 20 minutes. These days we walk her for an hour. We always choose a remote spot and make sure we pick her up when we see dogs or horses approaching. I remember the first time she spotted a horse – her chin dropped and she was just staring at it in amazement! Once we encountered some riders who were equally surprised to find us with a cat instead of a dog. My husband once also tried one of the bigger local parks (Roath lake), but it’s way too busy – you really need a quiet spot, plus I’d be weary of the ducks and swans! He also took her to the beach, but she hated the open space and the wind and was very unhappy. So now we just stick to the Wenallt, but are always on the lookout for a new quiet spot to walk her. The best thing about walking Bobby is the fact that when we come home she is just the happiest and most content cat in the world. She rubs everything and everyone and then falls asleep quickly, dreaming of her little adventure. And when she’s happy it makes us happy too. Start as early as possible and be patient. Cats are not dogs!! Choose a harness with breakaway buckles – they are easier to attach and safer. Get your cat used to just wearing the harness in the house – this might take a few days, depending on your cat. Maybe you want to reward your cat with some treats. 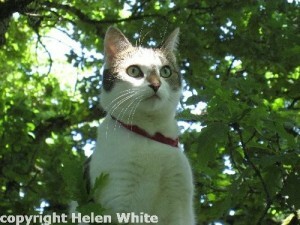 Once your cat is comfortable enough and doesn’t mind wearing the harness, it’s time to venture out into the garden. In the beginning the leash that comes with the harness is enough. But as soon as you start going further afield it’s time to invest in a re-tractable dog leash (the smallest to avoid funny surprises) ours is a flexi comfort long 1. Once she is used to the garden on the leash, you can start going further afield. 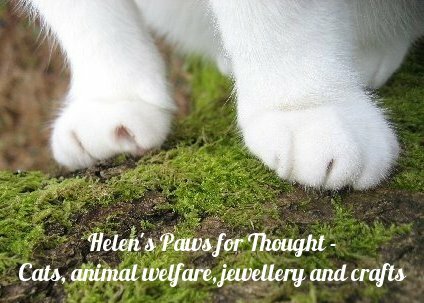 Cat walking is not the same as dog walking – cats love to hang around and sniff a lot and just sit and stare. It can be incredibly boring and you need a lot of patience. They also have one disgusting habit –when they can smell out the scent of another cat they tend to roll in it (yuk, I know). Be aware of dogs – as soon as I see a dog approaching (unless it is considerably smaller) I pick her up. I don’t want to tempt fate here. 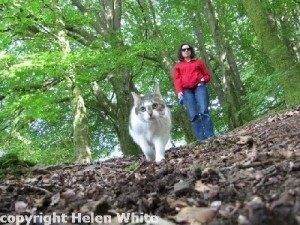 If you want to give your cat a real adventure and change of scenery – explore your local forests. Make sure you transport her in a safe carrier in your car and also use your seat belt to secure it. Beaches – ours didn’t like the beach one bit – too windy. By all means, try it out, maybe your cat reacts differently. Open spaces – cats hate them, because they are predators – always choose a spot that gives her a sense of security and being able to hide.